While organizations like the Knight Foundation have begun to chart the field of civic tools, the designations are often assumed to be apolitical and merely representational of the genres of tools that exist in the space. But as the area of civic media begins to get more attention and such tools are increasingly the subject of (warranted!) criticism from academics (myself and Eric Gordon, Dan Kreiss, Jenny Stromer-Galley, and Jim Katz have all written about how pseudo-engaging tools are being adopted in campaigns and in governance). It’s no secret that campaigns want to control public discourse. Political professionals admit it, and while the democratizing potential of the internet is a refrain we often hear, persuasive arguments that we are merely having the wool pulled over our eyes while we are controlled in ever-more nefarious ways have been pretty compelling (see: Phil Howard, Eli Pariser, Matt Hindman). Despite this seemingly obvious truth, in many ways, the 2010 midterm elections marked a change in campaigns’ ability to control messages. Across the nation, communications offices still attempted to tamp down on messages that are misaligned with their own, and publicized those they preferred, but their ability to do so—or at least to do so overtly—was diminishing. While digital technologies are certainly used to control which potential voters get what messages, digital media are also confounding the traditional stranglehold campaigns have had on the information that circulates about a candidate. Ultimately, campaigns used social media tools in ways that made a significant move away from traditional, overt control, which involves the direct censorship of comments. Rather than relinquishing control entirely, they moved toward new methods of control that have varying levels of openness. Often, when shifts in strategy occur, they are just that: strategic. But the tactics and strategies deployed by campaigns in 2010 tell a more interesting story. When traditional forms of control such as censoring or deleting public commentary became dangerous, rather than slip into a slightly less visible form of control, campaigns—due not to their desires, but because of the consequences of their technical choices for media platforms and their shifting organizational structure—found themselves needing to deploy new and different forms of control. In the midst of the many great discussions about the technological shortcomings of Obamacare’s Healthcare.gov website, the frontend has largely escaped commentary–mostly because it has functioned. But the user interface is more than just functional; its aesthetics are also interesting enough to merit some discussion. It has a look that has been described as “lean,” “slick,” “ungovernmenty,” and “compared favorably with top commercial sites.” These are not exactly things we expect to see from our government websites. As Americans collectively sighed over the fact that the National Zoo’s Panda Cam went dark during the shutdown, I also saw a friend’s complaint that her need to peek into the digital archives of the Library of Congress was thwarted. A quick look revealed NASA had a similar error message. Even the official White House, though functional, put up a large splash page that darkened the site’s content and clearly articulated that the shutdown could affect the site. More than just a notice, whitehouse.gov’s response to the shutdown was (is, as I’m writing) to literally take the actual whitehouse.gov homepage dark (literally, but briefly; anyone can click through to the actual site). Sure, websites need to address the fact that they are not changing/updating content, just like museums and national parks need signs that say they are closed for the time being But other government websites like the Smithsonian managed to place a notice on a page without closing its virtual doors. So why the big show? Here, I’ve often written about how tools and texts construct visions of citizenship, but I’ve been spending a lot of this year focused on actually making those tools and texts that construct better forms of citizenship. This policy brief, authored with my colleague Eric Gordon, lays out some specific ways to do that. Focusing on tools for reporting issues to the city, often referred to as CRM (constituent relationship management) systems, we discuss the existing state of these tools while also making recommendations for how to make them more engaging and more productive for civic life. While this brief argues that a lot of government’s current use of technology are transactive and therefore lead to more shallow or thin possibilities for citizenship, it’s by no means limited to that (nor do governments–especially those like our New Urban Mechanics partners in Boston–necessarily want to limit citizenship in this way). By providing recommendations for how to get to deeper, more interactive forms of citizenship, hopefully this brief also makes it clear that academic work doesn’t stop at investigating and illuminating what exists, but should try to develop ideas for how to improve the state of things when practical. A complete cycle of blog post, chapter, article in Journal of Information Technology and Politics for the concept of skeptical citizenship–exciting day! 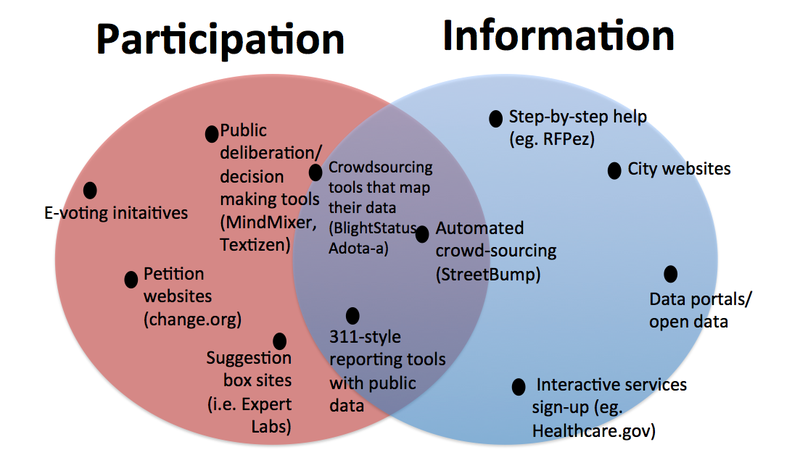 Develop tools that both increase participation and (more importantly) move civic engagement from a merely transactional process with government to one that is interactive. Engage in design-based iterative research that informs the creation of new civic tools, studies their outcome in nuanced ways that can get at deeper engagement, and use those findings to iterate and improve the tools themselves.